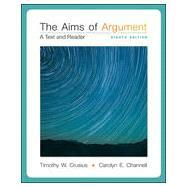 NOTE: Aims of Argument: A Brief Guide (ISBN 9781259188503) is available through Create. 13. Global Warming: What Should Be Done? 16. Declining Civility: Is Rudeness on the Rise? 17. Enhancing Humans: How Far Is too Far?